One of the biggest social media challenges for businesses is to understand and measure the true value of various social media channels. For years, marketers have relied on last-click attribution to provide insights and ROI data for their digital marketing efforts. With social media however, the conversion is not typically driven directly from the platform, leaving many without a clear picture of how social media helps their businesses. Despite these issues, many businesses are finding social media can drive results. While these statistics only show a small piece of the puzzle, they demonstrate why businesses can’t ignore social media marketing. The other side of the coin is the customer. While businesses may be concerned about ROI and wonder how social media can help drive revenue, customers increasingly turn to social media to talk to businesses and get recommendations on products and services from their peers. In fact, 77 per cent of brand conversations on social media are people looking for advice, information, or help. As a business, it’s your job to listen, respond, and give customers and potential customers the information they need. If you do, you’ll be rewarded. So how do you ensure your business is prepared for this new age of customer service and to help potential customers become customers? You need a tuned-up strategy. A common misconception with social media is that you can jump right in. Unfortunately, that mentality is why many businesses give up on social so quickly. Like any other marketing channel, you must have a strategy and you must constantly improve it in order to be successful. Not every business needs to be on every social media channel. Each channel has something unique to offer and is used differently by different audiences. For example, Facebook users cite photos and videos as a large reason why they use the site, while LinkedIn users report finding employment and researching companies as their primary reasons for use. These are two very different use cases. For businesses, specifically those with limited resources, time must be spent on the channels that will actually reach the right audience and help drive the overall business goals. To find which channels are right for your business, start by looking at what your customers are using. If you’re using an analytics platform, you have a good idea where your traffic comes from. 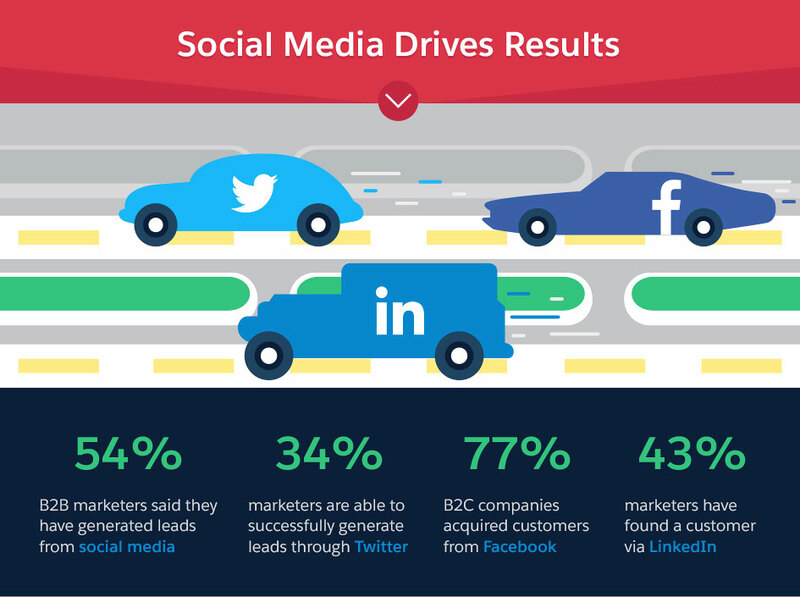 Check out the social referral data to see which social media channels drive the most traffic. Even though you aren’t active on a particular channel, you may find your customers are using it, and they may already be talking about you there. That’s where you want to be. Where is your content currently being shared? Even if you aren’t promoting your content across social networks, your readers may be. Find out where they share your content and where it receives the most engagement. There are a number of tools out there that quantify how many shares a particular URL or a particular domain has. These tools will also break down the number of shares by network, which provides insights into the networks that generate the most engagement. Are you already monitoring your brand? If the answer is no, it’s time to get started. If the answer is yes, take a look at where your existing brand mentions come from. Are people talking about you on Twitter? Are conversations about your products happening on Facebook? Find out where the majority of brand mentions occur. Similar to social share data, this type of information shows exactly where customers are talking. Last but not least, make sure to utilize any existing customer data you have. While you may not have asked customers for their social profile information, you likely have their email, which can go a long way (if they opted into receiving emails from your business). Many CRM systems will match email addresses to social media profiles. There are also Gmail plugins that provide social data based on a person’s email. You don’t have to gather social data for every customer, but identifying patterns and seeing where your existing base is most active will give you a much better idea of which social channels to target. Next to identifying the right channels, pinpointing the right content to share on those channels is the most important part of your social media strategy. Just as there’s no need to be active on every single social channel, you don’t need to promote every piece of content across every channel you are active on. Client A is a marketing company that has multiple content resources on site. Each week they publish a mix of whitepapers, webinars, blog posts, videos, and/or news stories. When a new piece of content goes live, Client A posts the same message across all social channels. As they evaluate the performance of their social media program, they realize there is little to no activity on their posts and their networks haven’t grown. An active Facebook audience doesn’t want to see the same posts as the audience on LinkedIn. As a business, if we want to keep our existing audience interested and grow our networks, we have to give them the content they want. Using the social network data in analytics, look at the top content by network. See if you can identify any trends. Do any topics or content formats stand out? For example, are Twitter users more likely to come to the site via a list post than a whitepaper? Do the same with your social share data. Take a look at which type of content generates the most shares by channel. Search for patterns. Most importantly, don’t overlook your existing social insights to see which content has performed the best on each channel. Twitter analytics, for example, will show top tweets while Facebook Insights will show top posts. This can paint a picture of what your existing audiences like and want they want to see. In the case of Client A, their Twitter audience prefers to share lists about social media topics while their Facebook audience prefers to see photos of the company and the team. This type of data helps plan what content to share in order to see the best results. Remember, give your audience the content they want instead of the content you want them to have. 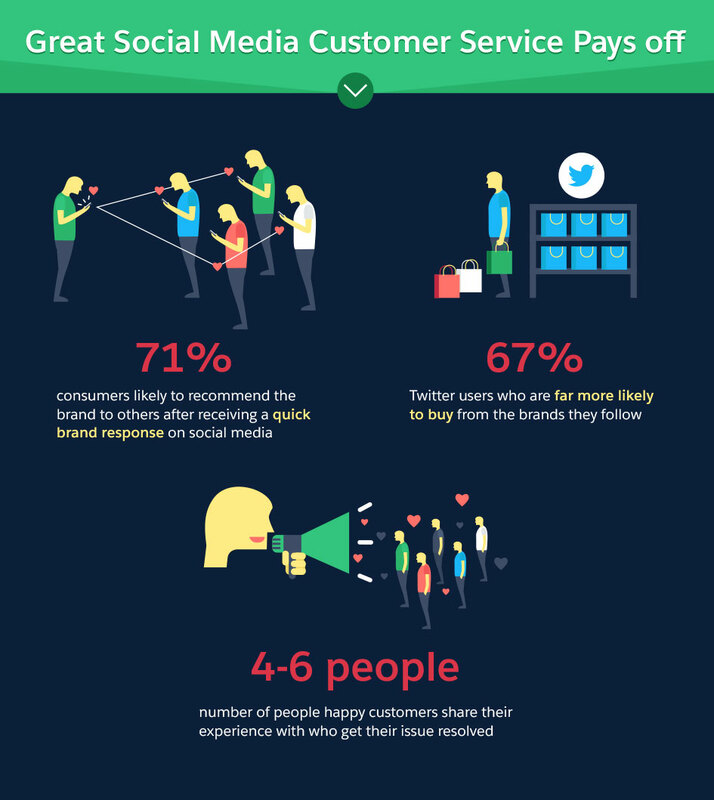 As use of social media for customer service grows, people want answers and they want them fast. Is your social media team prepared and are they empowered to make business decisions? How easy is it for your social media team to resolve a customer issue? If a follower asked your social media team a question that your support team normally gets, would the social team be able to resolve it? What about a person interested in learning about your product or service? Could your social team point the customer in the right direction? Make sure your social media team has the information necessary to interface with customers and potential customers, plus the power to actually make customer service decisions. After all, many of the people who contact you via social don’t want to have to pick up the phone and call, so don’t make them. When it comes to monitoring social channels, it’s not enough to just track brand mentions. You should also track specific keywords your audience uses to describe your product or service. Any recommendations on web conferencing software? Anyone have a good web conferencing tool they use? We are looking for one for the office. Neither of these examples mentions a specific company but someone from your social media team should be aware of these conversations and be ready to jump in and offer any help. Which keywords should you track? If you have an SEO or pay-per-click (PPC) team on staff, the first step should be to reach out to them. Both of these departments will have extensive knowledge of the ways people search for the service or product and can likely offer insights into exact keywords or keyword phrases to track. Hashtag tools can also provide you with some ideas. Use the keyword data you have to find out which hashtags are used in relation to each term. These can then be used when promoting content relevant to specific keywords. By tracking target keywords, you can get in front of potential customers and help answer any questions they may have early on in the buying process that you could miss by only monitoring brand terms. Brand advocates, people who talk favourably about a brand or product and then pass on positive word-of-mouth (WOM) messages about that brand to other people, are invaluable. These are usually existing customers, employees, friends of the business, or people who have had a positive experience with the brand. These people are priceless to your social media program and business overall. Think about it this way: If you asked for a recommendation on Twitter, would the response be more powerful from a company or from a person who actually uses the company’s product? Build up your list of brand advocates. Find the people on social media already talking about you and figure out how to get them involved. Encourage and reward them for their positive responses. Ask them to reach out to the person inquiring about your company just as you’d ask a customer to be a reference during an RFP process. LinkedIn and Google+ each have highly targeted groups. For example, if you are an email marketer, there are dozens of email marketing groups to connect with peers and discuss the industry. Twitter, on the other hand, has very specific chats for groups and industries (i.e. #seochat, #b2bchat, and #hrchat). These are prime targets for marketers. For example, if you sell to HR professionals, check out LinkedIn HR groups. See what they are talking about in each group, join in the discussion (without selling), and then use that information to create content on your own site or to participate in other groups or Twitter #hrchats. This is a great way to get in front of potential customers without looking like your main focus is to sell something. Social media isn’t all about content promotion and company updates. Features including Twitter cards and LinkedIn publishing offer businesses a way to actually generate leads, as well as encourage users to take an action. Twitter has lead generation cards, which allow users to sign up for an offer or even opt into a newsletter directly from Twitter. Twitter cards are fairly easy to set up and drive leads directly from the platform. LinkedIn publishing, on the other hand, provides a publishing forum within the network. You can publish posts to LinkedIn and notify your connections; if your content performs very well, it may even get promoted to the main feed. For LinkedIn publishing, consider the content strategy mentioned above. Summaries of case studies or report data tend to do well and provide you the opportunity to send readers back to the main business site for the full results. 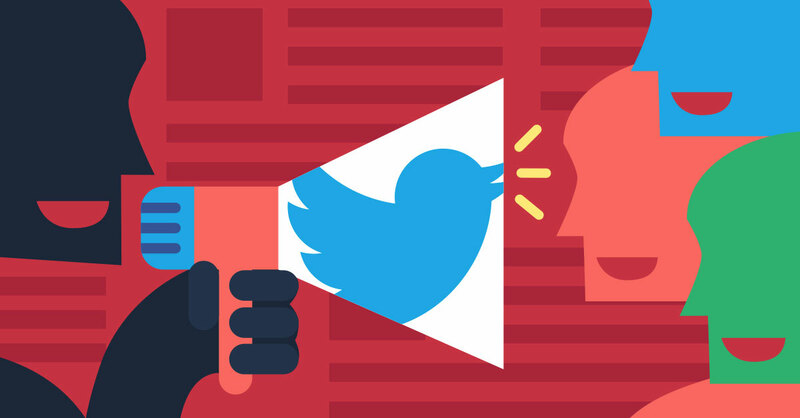 Over the past year we’ve seen Twitter integrate more ads into feeds, Pinterest continually work toward creating better ad options for businesses, and Facebook stand as the most common platform for running paid social campaigns. 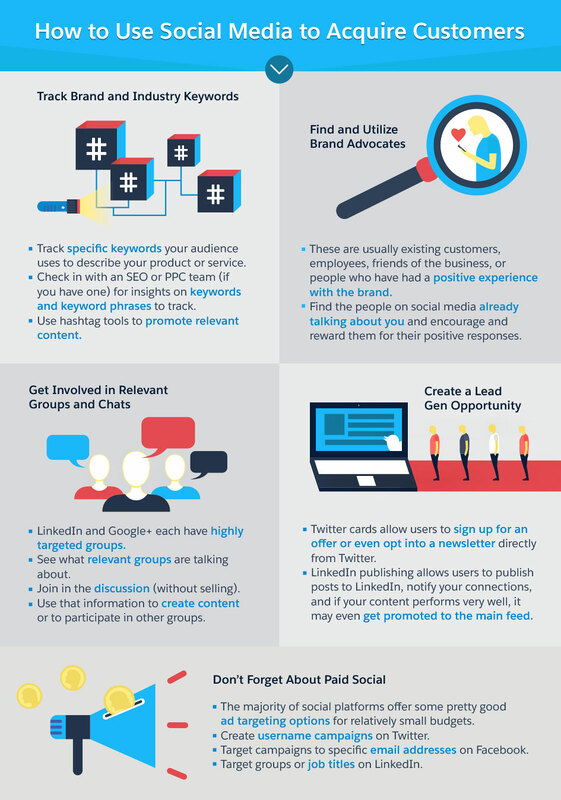 For marketers, you have to pay to play if you want your business visible on social media. On a positive note, the majority of social platforms offer some pretty good ad targeting options for relatively small budgets. Twitter, for example, lets you create username campaigns, which target ads to users who follow a specific username or are similar to that username (such as competitors or industry influencers). Facebook allows businesses to target campaigns to specific email addresses (such as people who have signed up for a report but are not customers). LinkedIn allows businesses to target specific groups or even job titles. Each of these platforms gives you the opportunity to reach your desired audience in a very targeted manner. A social media marketer’s job is never really done. The process outlined above will need to be continually evaluated, revised, and then revised again. Make sure you have tracking in place, revisit your channel strategies every six to 12 months, revisit how users share your content, and don’t be afraid to test. Be on the lookout for new and evolving tools for tracking your channels. Social media provides businesses with a means to get in front of customers, interact with potential customers, and showcase the brand in a way they never have before. Don’t the let opportunity go to waste.